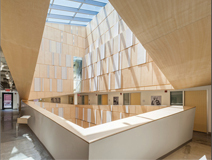 The Harvard Faculty of Arts and Sciences (FAS) renovation of Tozzer Library involved a complete gut renovation of the existing 26,000 square foot library. The project scope also added a 10,000 square foot fourth floor which provides additional floor area for office space and new mechanical systems. The original building was designed in 1974 by Johnson and Hodvelt and served as a library for anthropology and anthropologic research. The new building’s lower two floors accommodate the Tozzer Library offices, reading rooms, library stacks, special collections area, and library support services. A skylight brings daylight into an atrium through the upper levels. The upper levels consist of classrooms, faculty offices, and graduate student offices for the Department of Anthropology. Also, alterations were completed around the building to improve stormwater management.